Lake Country - Tangerine Hydro Tech pad 6.5"
Lake Country Tangerine Hydro Tech pad 6.5"
The Lake Country Hydro-Tech 6.5 Inch Foam Pad is one of each European pre-polymer foam pads. Lake Country' s Hydro-Tech Foam Pads are designed specifically for the application of water-based polishes and compounds. The imported pre-polymer foam prolongs the working time so you have more time to create a flawless finish. Hydro-Tech Inch Foam Pads are ideal for professional, body shop-safe polishes. Use a finishing polish or fine swirl remover to create a deep gloss. Menzerna Super Finish 4000 and Meguiars Ultra Finish(205) is excellent choices for this pad. Description Get the most working time with water-based polishes!The Lake Country Hydro-Tech 6.5 Inch Foam Pad is one of each European pre-polymer foam pads. Lake Country' s Hydro-Tech Foam Pads are designed specifically for the application of water-based polishes and compounds. The imported pre-polymer foam prolongs the working time so you have more time to create a flawless finish. Hydro-Tech Inch Foam Pads are ideal for professional, body shop-safe polishes.Lake Country Hydro-Tech 6.5 Inch Foam Pads are made of imported European pre-polymer foam. This long-wearing, high quality foam is less absorbent in order to keep the majority of polish on the pad's surface. You'll experience a longer working time with your water-based polishes and compounds, resulting in less product used to achieve the perfect finish.Water-based polishes can soak into some foam pads like, well, water. That requires you to keep reapplying polish to the pad. With Lake Country Hydro-Tech 6.5 Inch Foam Pads, water-based polishes work longer and you use less polish. You'll save time and polish!The Lake Country Hydro-Tech 6.5 Inch Foam Pads accomplish defect removal and finishing in just one step. This special foam composition leaves no marring so, even after compounding with the blue cutting pad, the finish is nearly wax-ready. 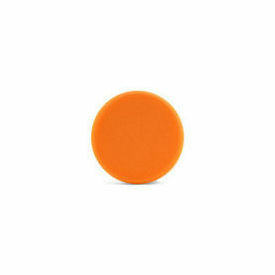 Think of these pads as all-in-one polishing and finishing pads.Lake Country Hydro-Tech 6.5 Inch Foam Pads are available in two varieties: Tangerine Ultra Polishing Foam - The tangerine foam is made for light to moderate defect removal and polishing. It has the cutting power just below that of the Lake Country orange light cutting pad, and the tangerine pad leaves a finish like you'd achieve with a gray finishing pad. Use a finishing polish or fine swirl remover to create a deep gloss. Menzerna Super Finish 4000 and Meguiars Ultra Finish(205) is excellent choices for this pad. Like Lake Country's other premium foam pads, Lake Country Hydro-Tech 6.5 Inch Foam Pads are made with high quality hook and loop backing. The pads work with a 5 or 6 inch hook and loop backing plate. The pads' size is perfect for a dual action or random orbital polisher. The flat face of the Lake Country Hydro-Tech 6.5 Inch Foam Pads also helps to keep water-based polishes on the surface of the pad. The flat pads maintain full contact with the paint, and they have enough flexibility to hug the curves and contours of your vehicle.Lake Country Hydro-Tech 6.5 Inch Foam Pads work with any type of polish but they're pre-polymer composition makes them ideal for water-based polishes. Water-based polishes are used by body shops and paint shops because the oils in silicone-based polishes will interfere with paint. If you want a professional quality finish, water-based polishes applied with applied with Lake Country Hydro-Tech 6.5 Inch Foam Pads are the way to go. They'll save you time and polish!